Nottingham Forest boss Aitor Karanka has taken a thiny-veiled swipe at both Jason Cummings and Rangers (not to mention the ex-boss) by attacking his striker’s loan spell in Govan. "If they were unable to play at Bolton or at Rangers, imagine how difficult it is going to be for them to play here." Where do we even start with this? 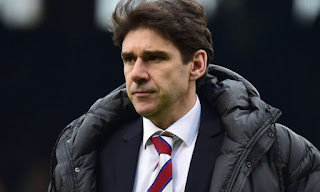 First off it’s evident just why Cummings doesn’t want to be at Forest any more, with a manager who shows such utter disrespect for the clubs giving his players experience. Secondly, to suggest it is harder to get in the starting XI for Nottingham Forest than for Rangers, or to imply Forest are a bigger club, is, absurd at best and insulting at worst. Thirdly comparing Bolton Wanderers with Rangers is absolutely staggering. Lastly, if he had been a half decent manager paying attention (he's actually managed to be worse than his predecessor Mark Warburton - taking Forest from 14th to 17th) he’d have seen how well Cummings actually did when given proper chances, but evidently he didn’t pay attention. Cummings has stated he wants to stay, and Forest fans have taken to social media to smear the lad and say how badly they want rid of him as well, so frankly the sooner the club can get this one wrapped up, the better. They were moaning last week and saying hands off, and then they seemed to remeber we had a but out clause and now they are slateing him and us. The other mob would also struggle in that league, trust me they are not as good as they think they are. Another piece of crap that the Rangers P.R. machine should start firing back at. Once they start doing so, and keep doing so, people will think twice. Also, if the "quote" is indeed accurate... If I were the owner I would really start to worry about a manager who puts my team in a weak bargaining position.